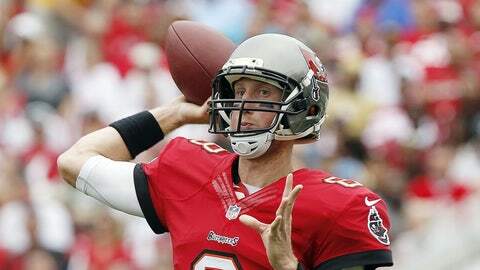 Tampa Bay Bucs QB Mike Glennon struggled during Sunday's 33-14 loss to San Francisco. TAMPA, Fla. — The Tampa Bay Buccaneers rushed and rallied. But in the end, their late surge fell short. They entered Sunday winners of four of their past five games, but the Bucs faced a steep 17-0 deficit to the San Francisco 49ers late in the second quarter. They closed the gap to 20-14 early in the fourth, but the visitors put the game away with a 21-yard field goal by Phil Dawson with 4:27 left. The better team won. Most of the afternoon, the Bucs were limited on offense, and Tampa Bay struggled to scrape together consistent scoring drives. Give the Bucs this: They only produced 98 yards in the first half, but they recovered to make things interesting early in the fourth quarter. However, the effort was too little, too late. 1. The Bucs never were a threat on the ground. This is no surprise. The 49ers’ defense has clamped down on running backs all season, never allowing a 100-yard rusher. Bobby Rainey has had a few sparks in his short Tampa Bay tenure — 163 yards against the Atlanta Falcons and 127 against the Buffalo Bills — but the 49ers bottled him up all afternoon. The Bucs had to have some sign of a running threat to have a chance Sunday, but they couldn’t sustain one. Not close. 2. Mike Glennon couldn’t kick his mini-slump. Like Rainey’s struggles, Glennon’s tough afternoon was little surprise. San Francisco has one of the league’s elite units — it entered ranked fourth in total defense — but Glennon’s recent slide is concerning. The book is out on the Bucs: Shut down the running threat and force the rookie to beat you. Sunday, the passing game had some promising glimpses, especially in the Bucs’ two scoring drives. But they weren’t enough. Glennon completed 18 of 34 passes for 179 yards with two touchdowns and one interception. Glennon has two games left to enter the offseason with positive vibes. The St. Louis Rams are beatable, but he should face a stiff test against the New Orleans Saints in the season finale. 3. The Bucs struggled to contain Colin Kaepernick. Kaepernick is fast, agile and quick with key decisions in the pocket. That’s a brutal combination for any defense, and it proved worrisome for the Bucs. Both Mark Barron and Johnthan Banks had rough days in the secondary. One of Tampa Bay’s best plays on defense — an interception by Lavonte David early in the third quarter — was wiped away because Gerald McCoy lined up offsides. Before Sunday, the 49ers had scored at least 19 points in each contest during their three-game winning streak, so the Bucs knew what they faced. It’s easy to see why Kaepernick has become one of the game’s most promising young stars, and he extended that reputation Sunday. He finished 19-of-29 passing for 203 yards with two touchdowns — more than enough to do the job. 4. The 49ers offered a glimpse of how far the Bucs must go. San Francisco is where Tampa Bay wants to be. The 49ers are disciplined, well-coached and they make opponents pay for self-inflicted errors. The Seattle Seahawks, rightfully so, have received most of the attention in the NFC West, but expect the 49ers to do damage in the playoffs. It should be an interesting postseason with this bunch. Tampa Bay, meanwhile, can handle struggling teams such as Atlanta and Buffalo, but Sunday’s result showed how far Greg Schiano’s team must go to be competitive against one of the NFC’s elite. Yes, the Bucs fared well in Seattle, and the argument can be made that they should have pulled the upset that day. Still, they found a way to lose when victory was within reach. On this afternoon, though, there was little drama. The better team exerted its will early and won. 5. Little about this day was a surprise. Yes, the Bucs entered as winners of four of their past five games. But the 49ers are better than any of the teams the Bucs beat in that run. Only the most optimistic in pewter and red predicted an upset Sunday. What’s left? The St. Louis Rams are beatable next week. Likely, that’s the last good chance Tampa Bay has for a victory this season, with a trip to New Orleans looming to close the year. The Bucs, for the most part, should be encouraged by how their defense fared against Kaepernick and Co., who produced 376 yards. But the shortcomings of Mike Sullivan’s offense proved to be the difference. Wipe away the memory of this one. Another week awaits.